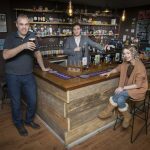 Craft beer boom is good news for Rhyl micropub with big plans for expansion | News by Wales Express News, People Before Profit! A Rhyl micro pub at the forefront of the real ale revolution is celebrating its first year in business with the news that its owners plan to be toasting their success in a total of 12 bars by the end of the year. The Dove in Rhyl, on the corner of St Margaret’s Drive and Rhuddlan Road, was the first of a new breed of pub opened by Dovecote Brewery last March and since then three more have followed. The Denbigh-based brewery have also opened a Dove in Prestatyn and two similar micropubs christened The Hoptimist in Rhuddlan and Abergele in collaboration with the Cwrw Ial Brewery, from Eryrys, near Ruthin. The Dove in Rhyl was where it all began though and Dovecote Brewery owner Richard Green said: “We wanted to create a new business model because it can be a problem for a small craft brewery actually getting your beer into pubs because many of them are owned by big breweries which limit the ability of tenant landlords to introduce such products. “We could see that there was a move from faceless cheap mass-produced beer towards customers being able to identify the provenance of what they eat and drink. “We knew there was an appetite for a better quality product and wanted to offer an alternative, more natural local craft ale so we decided to open the Dove micropub where we stock beers from 42 Welsh craft breweries and a few from over the border in North West England. “We chose Rhyl to launch our first micropub because we identified that the locals were very responsive to what we were proposing and the support from the local community has been fantastic. The Dove’s offer combines a high quality local product with a warm, welcoming and slightly quirky venue and is part of a growing network of passionate independent food and drink retailers available on the county’s high streets that Denbighshire County Council’s #lovelivelocal campaign is promoting in the run-up to Easter. The project sees the Dove and other food and drink producers and retailers in the county’s eight main towns featured on a series of videos on social media. As part of the latest #LoveLiveLocal campaign shoppers can support local independent businesses by using the hashtag on Twitter and Facebook to share good experiences they’ve had as well as promote the high quality food and drink locally they have ‘loved’. Hugh Evans OBE, Leader of Denbighshire County Council and, as a farmer, a food producer himself, said: “This is a celebration of the fantastic range and quality of our food and drink offer in the county. “We want people to enjoy the experience of Denbighshire’s town centres so there’s no need to jet off to foreign climes when you can shop, dine and relax in our wonderful and historic town centres. “And when you stop for a meal or a drink or to buy food in one of our many fine shops, restaurants and pubs you can find out the story about the produce they offer and where it comes from. As part of the #LoveLiveLocal campaign, Denbighshire County Council will be rolling out a series of short video clips to highlight what the county has to offer shoppers and the campaign will encourage people to support local independent businesses by using the hashtag on Twitter and Facebook to share good experiences they’ve had as well as promote products and services locally they have ‘loved’. Richard, an industrial chemist originally from Walsall, in the West Midlands, and his wife, Sue, from Rhyl, set up Dovecote Brewery in Denbigh 20 months ago when he decided to make his home brewing hobby into an alternative career. They set up the brewery in Denbigh and started brewing in June 2017 and initially sold to pubs in the area and very soon we were supplying to 42 outlets. It was a very good start however that wasn’t enough for this enterprising husband and wife team. Richard added: “We wanted to grow a self-sustainable business and that’s why we opened the Dove in Rhyl which our son, Dominic, runs. “It just made perfect economic sense to open our own pubs and to do it in a particular way. “We’ve tried to create a special atmosphere with no music, electronic games or food but you can be sure of a warm welcome, good conversation and a great choice of craft beers, gins and ciders. “At Dovecote we use only the best ingredients including mains water which comes from Llyn Alwen on the Denbigh Moors and we’re very much focused on our ales being a natural product and we now brew 12 different beers, some of them seasonal. “The footprint of each Dove or Hoptimist outlet is more compact than your usual pub, but we have a wide demographic and appeal to ladies and gents alike. “Many people will come here who wouldn’t go to more conventional kinds of pubs, including single woman who feel more relaxed in the atmosphere we create. “It’s something we believe in and know it works, so much so that we are now looking to roll it out further afield. Denbighshire County Council’s #LoveLiveLocal 2019 campaign to promote the county’s retail attractions uses the hashtag #LoveLiveLocal across all social networking platforms to encourage shoppers to visit its towns. For more on #lovelivelocal go to as well as on Facebook and Twitter. 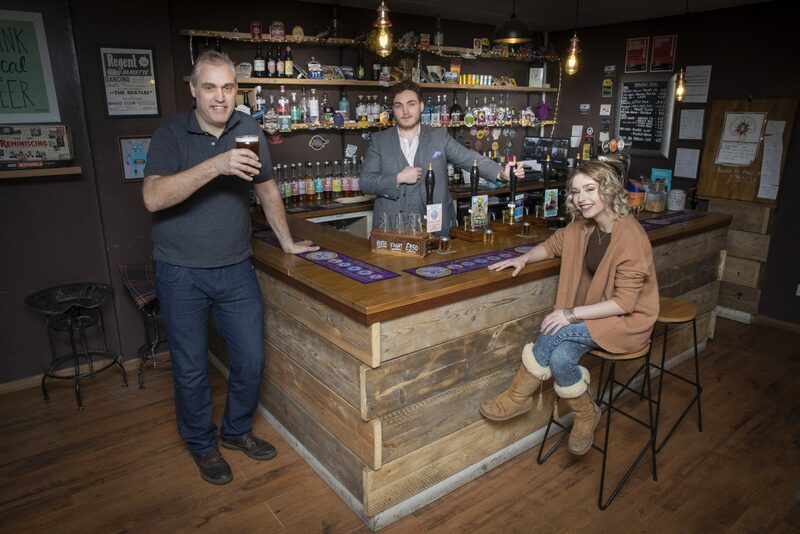 Micropub 1,2,3, Denbighshire shop local; The Dove at Rhyl, Rhyl’s first Micro pub; Pictured are Richard Green, his son Dominic and Lauren Howell. Micropub 6,7,8 Pictured is Richard Green.